Firstly, the big secret about growing auriculas is; there is no secret. Some growers use a particular type of compost purely by choice, others might buy the cheapest available and have good results. Some like John Innes No. 2, some prefer No. 3 and might use either with equal parts of peat based compost and grit. We also know growers who will use peat-free compost and vermiculite. Others we have met over the years have admitted to growing the plants in tubs in garden soil that has not been renewed for many years. There is no secret feed that growers give their plants either, some use tomato food or miracle-gro or chempak balanced feed, some use blood fish and bone, others use nothing, simply relying on a good base mix when re-potting. Auriculas can have fleshy leaves though it is not a “succulent” it is an alpine. The plant’s original home was in Southern European mountainous regions between five hundred and five thousand feet, their roots searching through the scree for water and nourishment as many alpine plants do. We therefore water carefully, use lots of drainage material like grit and perlite and when growing in pots we keep them out of the sun’s reach. In the garden, their roots in the ground they can tolerate sunshine but prefer some dappled shade. The auricula does not need a heated greenhouse in winter and will not tolerate a conservatory in the summer, though we do know someone who tried both with disappointing results! Our auriculas are often frozen in the pot in winter but suffer no harm providing the soil in the pot is not saturated. 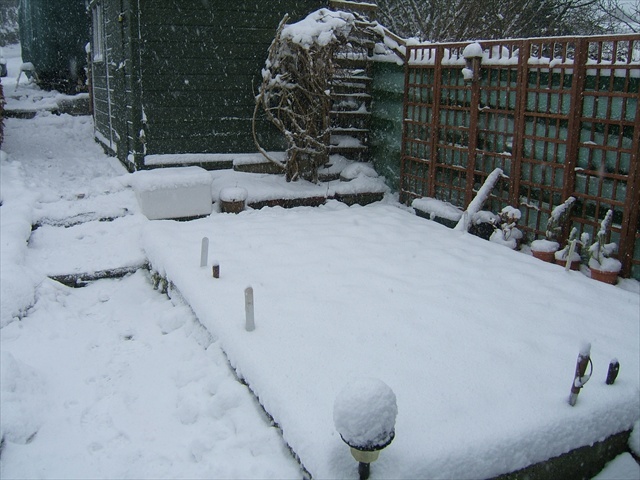 The two pictures show a temporary bed before the Flower Shed was built where we put some of the plants, picture 1. auriculas under snow, the snow stayed for about five days. 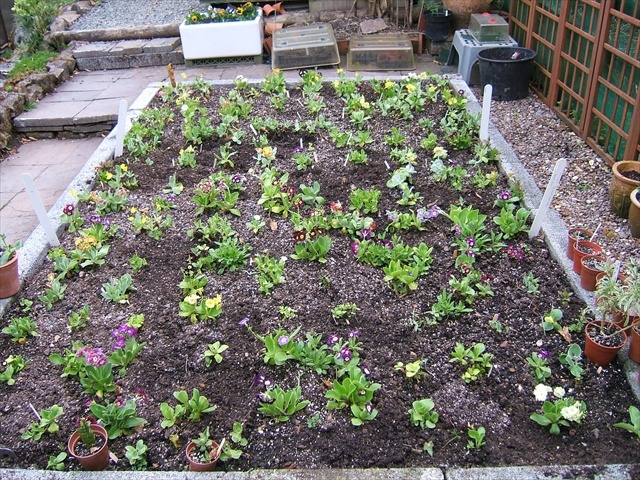 Picture 2. the auriculas four months later. It is not compulsory to grow auriculas in clay pots, it is simply more attractive than plastic! Clay pots can dry out much quicker so a careful watch on watering is important. If your plant looks a bit limp in the middle of a very hot day it does not need water – it needs to be somewhere cooler, a fine misting of water on the leaves will help far more than a drench. Try to move the plants to somewhere cool or take a few more sheets of glass out of the greenhouse, place some shading over the roof, or, best of all try to get your plants into cold frames for the summer.